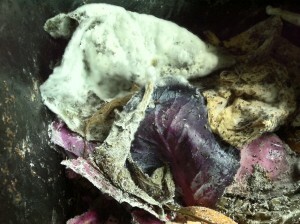 Characteristic of Bokashi, a fuzzy white mold smells slightly sweet. Bokashi is of Asian origin and is often reported as being invented in Japan. There is some debate as to when it was formally discovered or invented. It was introduced to our modern culture in 1982 by Dr. Teruo Higa, who developed a microbial starter culture that is marketed as “EM-1.” EM stands for Essential Microorganisms. Dr. Higa also published a book on the subject in 1993, “An Earth Saving Revolution: Solutions to Problems in Agriculture, the Environment and Medicine.” Further advancing the technique. Fermented vegetables and harvest waste have been a part of traditional Asian agriculture for some time, and there is little reason to doubt that the fertile byproducts have been recognized and used for some time. The process involves collecting food and garden waste, and subjecting it to an anaerobic environment, in which the dominant microbial process is fermentation. The process can be encouraged and accelerated through the addition of these microbes, usually in the form of fermented bran powder, or EM-inoculants. As the waste ferments, it releases a tea that is full of nutrients and beneficial microorganisms. I use a dilution of the tea to water my plants and they really get quite a kick from it. The solid contents of the bokashi take on a pickled appearance, often with a fluffy white mold. It smells like fermentation, somewhere between cider and stout, to my nose at least. It isn’t unpleasant if done correctly. You can see in the photo above, a well-colonized kohlrabi leaf and a less-well colonized red cabbage leaf. You won’t find recognizable bits in your seed balls of course. When the bokashi anaerobic ferment has completed, it is quite acidic and strong. I feed some of it sparingly to my worms, and the rest goes into aerobic post ferment, where it rapidly breaks down further. In about 6 months, it is unrecognizable, and seed ball ready. I also use bokashi tea to adjust the moisture of the seed ball matrix, so our seed balls are packed with fresh essential microbial populations. Bokashi is gaining popularity for several reasons. If you’re thinking about getting more serious about your composting, bokashi is a nice step. It’s about as exotic sounding as rotten food can get, too!